Map of Bakken Formation reservoirs in the US portion of the Williston Basin ( Saskatchewan is north border). Prior to 2007, most oil came from the Elm Coulee Oil Field. Besides the Bakken formation being a widespread prolific source rock for oil when thermally mature, significant producible oil reserves exist within the rock unit itself. Oil was first discovered within the Bakken in 1951, but past efforts to produce it have faced technical difficulties. The rock formation consists of three members: lower shale, middle dolomite, and upper shale. The shales were deposited in relatively deep anoxic marine conditions, and the dolomite was deposited as a coastal carbonate bank during a time of shallower, well-oxygenated water. The middle dolomite member is the principal oil reservoir, roughly two miles (3 km) below the surface. Both the upper and lower shale members are organic-rich marine shale. Most Bakken wells are drilled and completed in the middle member. Many wells are now being drilled and completed in the basal Sanish/Pronghorn member and in the underlying Three Forks Formation, which the North Dakota Department of Mineral Resources treats as part of the Bakken for oil production statistical purposes. Production is also enhanced by artificially fracturing the rock,  to allow oil to seep to the oil well. Although the amount of oil in place is a very large oil resource, the percentage that can be extracted with current technology is another matter. Estimates of the Bakken's recovery factor have ranged from as low as 1%—because the Bakken shale has generally low porosity and low permeability, making the oil difficult to extract—to Leigh Price's estimate of 50% recoverable. Reports issued by both the USGS and the state of North Dakota in April 2013 estimated up to 7.4 billion barrels of oil can be recovered from the Bakken and Three Forks formations in the Dakotas and Montana, using current technology. The flurry of drilling activity in the Bakken, coupled with the wide range of estimates of in-place and recoverable oil, led North Dakota senator Byron Dorgan to ask the USGS to conduct a study of the Bakken's potentially recoverable oil. In April 2008 the USGS released this report, which estimated the amount of technically recoverable, undiscovered oil in the Bakken formation at 3.0 to 4.3 billion barrels (480 to 680 million cubic metres), with a mean of 3.65 billion. Later that month, the state of North Dakota's report  estimated that of the 167 billion barrels (26.6 billion cubic metres) of oil in place in the North Dakota portion of the Bakken, 2.1 billion barrels (330 million cubic metres) were technically recoverable with current technology. The Bakken formation has produced oil since 1953, when a North Dakota well was completed in the Bakken. The 2000 discovery of the Elm Coulee Oil Field, Richland County, Montana, where production is expected to ultimately total 270 million barrels (43,000,000 m3), drew a great deal of attention to the trend where oil was trapped along the Bakken pinchout. In 2007, production from Elm Coulee averaged 53,000 barrels per day (8,400 m3/d) — more than the entire state of Montana a few years earlier. The Mondak Field to the southeast of Elm Coulee extended the productive pinchout trend into North Dakota. Elm Coulee was key to later Bakken development because it combined horizontal wells and hydraulic fracturing, and targeted the dolomitic middle Bakken member rather than the shales of the upper or lower Bakken. ^ Lexicon of Canadian Geological Units. "Bakken Formation". Archived from the original on 2012-07-07. Retrieved 2009-03-26. ^ Son of Bakken formation namesake remains reserved, December 3, 2012, Associated Press. ^ US Energy Information Administration, November 2008, Technology-based oil and natural gas plays: Shale shock! Could there be billions in the Bakken?, PDF file, retrieved 16 January 2009. ^ a b "3 to 4.3 Billion Barrels of Technically Recoverable Oil Assessed in North Dakota and Montana's Bakken Formation—25 Times More Than 1995 Estimate". U.S. Geological Survey. April 10, 2008. Retrieved October 24, 2016. ^ US Department of the Interior, "USGS releases new oil and gas assessment for Bakken and Three Forks", Press Release, 30 Apr. 2013, Department of Interior. ^ "New Drilling Method Opens Vast U.S. Oil Fields". FoxNews.com. 2010-04-07. Retrieved 2011-02-23. ^ "Producers turn to railroads for shipping Bakken crude". Tulsa World. 2011-01-28. Retrieved 2011-02-23. ^ "Bakken Crude Is Highly Volatile, Oil Study Shows". Wall Street Journal. Dow Jones & Company. Retrieved 2014-07-26. ^ "Search resumes in Lac-Mégantic for 5 still missing". 2013-07-21. Retrieved 2013-07-21. ^ "Graphic: Timeline of Events in Quebec Train Disaster". ^ Zawadzki, Sabina (21 November 2013). "Analysis: Bakken drillers undaunted by local oil prices under $80". New York. Reuters. Retrieved October 24, 2016. ^ US EIA, "Crude oil production", accessed November 25, 2014. ^ Dan Kohlruss and others, "Well stimulation observations in the Viewfield Bakken pool" Archived 2013-10-29 at the Wayback Machine, 2013. ^ Government of Manitoba, "Manitoba oil facts", accessed 17 Sept. 2013. ^ Donald Barrs, "Devonian System", in Geologic Atlas of the Rocky Mountain Region. Rocky Mountain Association of Geologists, Denver, CO, 1972: p. 98. ^ Yedlin, Deborah (2008-01-16). "Using horizontal drilling techniques in Canada". The Calgary Herald. Archived from the original on 2008-04-11. Retrieved 2008-01-23. ^ OnePetro. "Home - OnePetro". ^ Holubnyak; et al. "Understanding the Souring at Bakken Oil Reservoirs. SPE 141434-MS". OnePetro. Archived from the original on October 14, 2013. ^ Bloomberg News (August 13, 2013). "Fracking chemicals in spotlight as regulators investigate rail car corrosion and flammability of North Dakota crude". Financial Post. ^ Jim Efstathiou Jr. and Angela Greiling Keane (January 14, 2014). "North Dakota Oil Boom Seen Adding Costs for Rail Safety". Bloomberg. ^ "Fracking chemicals in spotlight as regulators investigate rail car corrosion and flammability of North Dakota crude". Financial Post. 2013-08-13. Retrieved 2013-08-18. ^ Jad Mouwad, "Fuel to burn: now what? ", New York Times, April 2012. ^ "Fracking pushes US crude output to highest level since 1989", Bloomberg, 11 Sept. 2013. ^ Price, Leigh. "Origins and Characteristics of the Basin-Centered Continuous Reservoir Unconventional Oil-Resource Base of the Bakken Source System, Williston Basin" (unpublished paper). Retrieved 2013-02-11. ^ Bakken Formation Reserve Estimates, which is a July 2006 press release from the North Dakota Industrial Commission which is part of the North Dakota state government thus in the public domain. ^ State of North Dakota Bakken Formation Reserve Estimates ( PDF). ^ "Continental statement: Bakken's giant scope underappreciated"
^ "Brazil's Oil Frontier: Sub-salt drilling could net billions of barrels". Archived from the original on November 14, 2011. Retrieved December 4, 2011. ^ Lenny Bernstein (April 30, 2013). "Northern plains site has twice as much oil as previously thought, Interior says". The Washington Post. Retrieved May 1, 2013. The doubling of the estimate resulted largely because of the first look at the Three Forks Formation in North Dakota, which the Geological Survey said contains 3.73 billion barrels of oil. 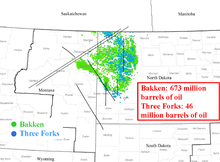 Its reassessment of the Bakken Formation, which lies above Three Forks, showed 3.65 billion barrels, only a little more than a 2008 USGS estimate. The agency's conclusion that the formations contain 6.7 trillion cubic feet of natural gas and 530 million barrels of natural gas liquids represented a tripling of previous estimates. ^ Stephanie B. Gaswirth; Kristen R. Marra; Troy A. Cook; Ronald R. Charpentier; Donald L. Gautier; Debra K. Higley; Timothy R. Klett; Michael D. Lewan; Paul G. Lillis; Christopher J. Schenk; Marilyn E. Tennyson; Katherine J. Whidden. "National Assessment of Oil and Gas Fact Sheet Assessment of Undiscovered Oil Resources in the Bakken and Three Forks Formations, Williston Basin Province, Montana, North Dakota, and South Dakota, 2013" (PDF). Fact Sheet 2013–3013. United States Geological Survey. Retrieved May 1, 2013. Using a geology-based assessment methodology, the U.S. Geological Survey estimated mean undiscovered volumes of 7.4 billion barrels of oil, 6.7 trillion cubic feet of associated/dissolved natural gas, and 0.53 billion barrels of natural gas liquids in the Bakken and Three Forks Formations in the Williston Basin Province of Montana, North Dakota, and South Dakota. ^ US Energy Information Administration, World shale gas, 17 May 2013. ^ Secondary recovery will drive the future of the Bakken Archived September 26, 2013, at the Wayback Machine, Oil and Gas Inquirer, 2013. ^ US EIA, Crude oil reserves, Table 2, 2013. ^ "New USGS Bakken assessment on its way", AAPG Explorer. ^ 2009 Magnolia Petroleum Current activities Archived November 16, 2010, at the Wayback Machine ( PDF). ^ Jarvie and others, Geology and geochemistry of the Parshall area Archived October 29, 2013, at the Wayback Machine, Rocky Mountain Association of Geologists, 2011. ^ Measure offers oil tax rate cut[ permanent dead link]. ^ Julie Lefever, "What's happening at Parshall, North Dakota" Archived May 28, 2010, at the Wayback Machine, North Dakota Division of Mineral Resources, 2 Sept. 2007. ^ 2007 North Dakota Oil Production by Formation ( PDF). ^ "Bakken shale oil", National Geographic Magazine, Mar. 2013. ^ ND Monthly Bakken Oil Production Statistics (PDF) (Report). North Dakota Department of Mineral Resources. October 2015. Retrieved 7 November 2015. ^ Drilling Productivity Report for key tight oil and shale gas regions (PDF) (Report). Energy Information Administration. October 2015. p. 3. Retrieved 7 November 2015. ^ "EOG Resources Inc". Eogresources.com. Retrieved 2011-02-23. ^ "Continental Resources Inc". Contres.com. Archived from the original on 23 February 2011. Retrieved 2011-02-23. ^ "Whiting Oil & Gas Inc". Whiting.com. 2009-12-31. Archived from the original on 8 February 2011. Retrieved 2011-02-23. ^ "Marathon Oil Corporation". Marathon.com. Archived from the original on 25 February 2011. Retrieved 2011-02-23. ^ "QEP Resources Bakken.pdf" (PDF). QEPres.com. Retrieved 2011-10-07. ^ "Hess Corporation - A Leading Independent Energy Company - ..itefinityWebApp_IN_0". ^ "Samson Oil and Gas Ltd". Samsonoilandgas.com. Retrieved 2011-02-23. ^ Gordon Pitts, Boom lets Saskatchewan plot its own course Archived May 14, 2013, at the Wayback Machine, Globe and Mail. ^ Financial Post, "Everyone into the Bakken Pool" Archived April 2, 2015, at the Wayback Machine, accessed 18 Sept. 2013. ^ "LIG Assets, Inc. Takes Position in North Dakota Oil Leases". ^ "Brigham Exploration". Bexp3d.com. Archived from the original on 22 February 2011. Retrieved 2011-02-23. ^ "Oil Boom Sparks River Fight: Landowners Sue as North Dakota Crude Production Reaches Missouri's Banks", The Wall Street Journal, April 2, 2012. ^ Ovale, Peder. " Her ser du hvorfor oljeprisen faller" In English Teknisk Ukeblad, 11 December 2014. Accessed: 11 December 2014. ^ Renshaw, Jarrett; Ngai, Catherine (3 November 2015). "U.S. oil refiners look abroad for crude supplies as North Dakota boom fades". Reuters. Retrieved 7 November 2015. ^ Cook, Lynn (28 October 2015). "Occidental Petroleum to Exit Bakken Shale Amid Heavy Losses". The Wall Street Journal. Dow Jones & Company. Retrieved 7 November 2015. ^ Berzon, Alexandra (12 March 2015). "Oil Deaths Rise as Bakken Boom Fades". The Wall Street Journal. Dow Jones & Company. Retrieved 7 November 2015. ^ Raphael, T.J. (18 June 2015). "Fracking in the Bakken comes with a high human cost". Public Radio International. Retrieved 7 November 2015. ^ "Takeaway capacity". Today in Energy. U.S. Energy Information Administration. 17 April 2012. ^ Allan Woods, "Lac Megantic: Train carried mislabeled oil", The Star, 11 Sept. 2013. ^ Koring, Paul (November 6, 2015). "Obama rejects TransCanada's Keystone XL pipeline". The Globe and Mail. Archived from the original on January 20, 2016. Retrieved November 6, 2015. ^ Geoffrey Morgan, "While Keystone-XL gets all the attention a new Bakken pipeline crosses the border", Alberta Oil Magazine, 6 Mar. 2013. ^ "Bakken shale natural gas flaring tops $100 million each month". ^ US Energy Information Administration, "North Dakota sees growth in real GDP", 12 July 2013. ^ "New Boom Reshapes Oil World, Rocks North Dakota". NPR. 2011-09-25. Retrieved 2011-12-02. ^ "Oil Boom Puts Strain on North Dakota Towns". NPR. 2011-12-02. Retrieved 2011-12-02. ^ "Affidavit: Abducted Montana Teacher Strangled in Cocaine Frenzy". Reuters. 2012-02-18. Retrieved 2012-02-18. ^ Associated Press (2012-04-23). "Bakken oil booms — and so does crime on the Plains". Fox News. Retrieved 2013-12-10. Wikimedia Commons has media related to Bakken formation. Geology.Com: Bakken formation, accessed 4 March 2009. US Geological Survey: Assessment of undiscovered oil resources in the Devonian-Mississippian Bakken Formation, PDF file, retrieved 4 March 2009.